Selfridges department store in London has teamed up with Yorkshire Sculpture park on a new contemporary sculpture initiative. New works will be unveiled every six months on a marble and steel monolith designed by the UK architect David Chipperfield as part of his commission to create Selfridges’ new accessories hall. The joint project, known as the Art Block, has been dubbed Selfridges’ version of the Fourth Plinth in Trafalgar Square. The Art Block will be curated by Selfridges staff along with Helen Pheby, the senior curator at Yorkshire Sculpture Park. The opening commission, entitled Phyllis (until 31 October), is by the UK artist Holly Hendry. “Phyllis stands at nearly four metres tall and features rubble created by the construction of the new accessories hall, along with silicone, gum, soap, ash, grit, lipstick pigment, aluminium, steel, jesmonite and marble,” a project statement says. The piece is named after one of the digging machines used in London’s Crossrail transport project. Selfridges is investing heavily in contemporary art. This week the UK artist Rebecca Ackroyd is due to unveil a new work in a third-floor art space within the store, known as the Courtyard. Selfridges is also backing a site-specific work by Darren Almond which will go on show in Crossrail’s new Bond Street station in December. The new piece is co-funded by the City of London Corporation in partnership with White Cube for Crossrail’s Art Foundation. Almond’s installation intends to encourage commuters to ponder on their journeys and the passing of time. 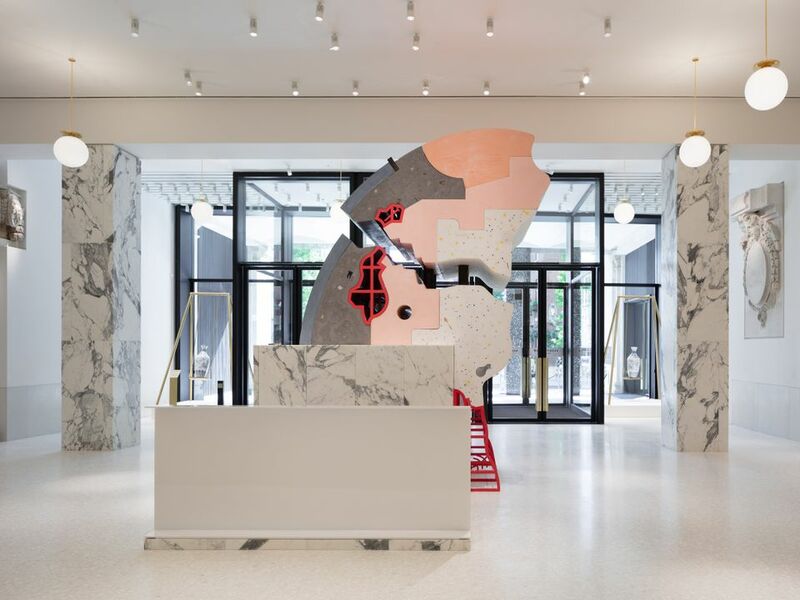 Last year, the store partnered with the non-profit organisation Artangel to create a pop-up charity shop on its third floor run by the US artist and writer Miranda July. Meanwhile, a major exhibition of Italian sculptor Giuseppe Penone’s work continues at Yorkshire Sculpture Park (A Tree in the Wood, until 28 April 2019).